Movie: "My Big Fat Greek Wedding 2"
Toula (Nia Vardalos) is back to working at her family's restaurant and spends most her time helping her parents when she's not clinging on to her daughter Paris (Elena Campouris). While researching his ancestry, Toula's father Gus (Michael Constantine) discovers that the minister forgot to sign his and his wife's marriage certificate, meaning they haven't been actually married during their over 50 year relationship. Now, they decide to make it official and have another Big Fat Greek Wedding. This movie is less OPA! and more OY VEY! 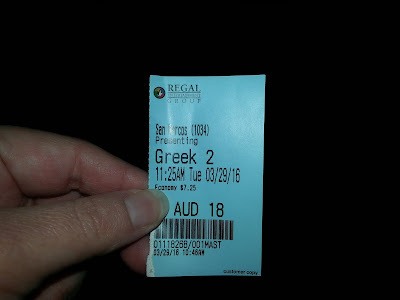 "My Big Fat Greek Wedding 2" should probably just be called "Hey, Look How Greek We Still Are!" For the second time, Nia Vardalos has written a script about how crazy it is to have a very large, very loud, very close-knit, very Greek family. Truth be told, since we loved the original, we were sort of looking forward to the sequel, but we wondered if the magic might be gone after a 14 year layoff from the Portokalos family. The trailer also didn't help matters since most of what was in it looked strangely identical to the beloved, endearing rom-com we were given in 2002. Our fears have now been sadly confirmed. This film is very much a rehash of what we saw the first time over a decade ago. Toula, again played by Nia Vardalos, is now a mother to a high school-aged daughter and has seemingly returned to her "frump girl" mode. The beginning of this sequel is nearly identical to its original as Toula gets berated by her father, is back to wearing glasses, doesn't really brush her hair, and doesn't wear make-up. Now she she is the one clinging to her daughter Paris, played by Elena Campouris, much like her parents clung to her. Toula's father Gus, again played by Michael Constantine, has already begun harassing his 17 year old granddaughter about finding and settling down with a nice Greek boy so she can have Greek babies. This, understandably, is driving Paris to get away from her family as she looks to attend an out of state college rather than staying close to home. Again, this is uniform with the first film's subplot, just updated with smartphones and more the now widely used internet. Toula also wants to put some romance back in her marriage with Ian, played again by John Corbett, which becomes the second subplot in the movie, only instead of focusing on their not so spicy marriage, this subplot becomes very throwaway after one or two quick exchanges. Finally, we get to the main plot of the film, the upcoming and impending Big Fat Greek. This time around, it involves Toula's parents Gus and Maria, again played by Lainie Kazan, who have recently discovered they were never officially married. A lot of the first two acts revolve around whether or not Gus will break down and properly propose to Maria, but considering the title of the movie, we know the answer to that question. Instead of a charming continuation story, "My Big Fat Greek Wedding 2" unfortunately feels like it's spinning its wheels and filling time until it gets to the lavish wedding at the end of it all. The movie winds up trying to juggle too many stories at once, none of which are the least bit compelling in the first place. In place of a true, realistically sweet romance, we are given an uninteresting, shoehorned in attempt to copy the success of its predecessor, plus an inexplicable cameo by John Stamos. We hate to say it, but in 2002 when the original was made, times were different. What was funny then is not necessarily funny now, and what worked so well about a dysfunctional, super proud Greek family now feels out of place and about 10-12 years past its expiry date. The humor has now become stale as we have seen this shtick be done in the past. It's also as if Vardalos wrote this sequel only to allow everyone in the film the chance to make this decade's paycheck because lord knows most of them haven't hit it big since '02, Joey Fatone included. And speaking of Joey Fatone, his character now gets a plot that could have made the most compelling story of them all, only to be glossed over quickly and never truly discussed at length on screen. We would have rather seen a movie dedicated to his character arc rather than the one we got about Toula's parents. It's cool everyone from the original was able to make it to this sequel, but not for the sake of good acting, a cohesive story, or really, necessity. In the end, what was good about the original "My Big Fat Greek Wedding" has evolved into a muddled mess of a movie that lacks the sincerity which made its predecessor so endearing. It's not harmful in any way and it certainly won't make any "worst of the worst" lists, but instead of being an earnest, believable story, it now feels forced, fluffy, and derivative, much to our utter disappointment. There are a few genuine laughs to be had here, but they are few and far between. It won't kill you to watch this sequel, but it's not going to do you any favors either. If you asked anyone else in our relatively packed showing, they would have probably had a completely different viewing experience as their howling cackles were indicative that some may enjoy this more than others, we just weren't two of them. Do we recommend this movie: Meh. One year ago, we were watching: "The Notebook"